The Mueller investigation wrapped up without any recommendation for further action, specifically against the President. It was a tense weekend while everyone waited for Barr’s report. To Trump, it was vindication and the President took to twitter multiple times. US GDP was revised down to 2.2% from 2.6% in the 4th quarter of 2018. Economists surveyed by Bloomberg project that growth in GDP will slow to 1.5 percent in the first quarter, the slowest pace in two years. Beto O’Rouke announced his run for president and raised over $6MM in the first day. The Federal Reserve left its benchmark unchanged in a range between 2.25% and 2.5% and suggested it would leave it there for many months. Bond yields sank across the yield curve and even inverted (more on this below in my 2 cents). Elizabeth Warren, a presidential candidate, proposes a wealth tax to boost federal revenue. The UK is headed for a no deal Brexit as parliament can’t seem to agree on a deal. Boeing’s 737 crashed for a second time and lead to its grounding worldwide. Not a surprise that the stock has been trading down since the crash and grounding. They are furiously working on a fix to it’s software to address the problem. March signaled a significant shift in the Fed’s forward guidance and rhetoric as they left rates unchanged. 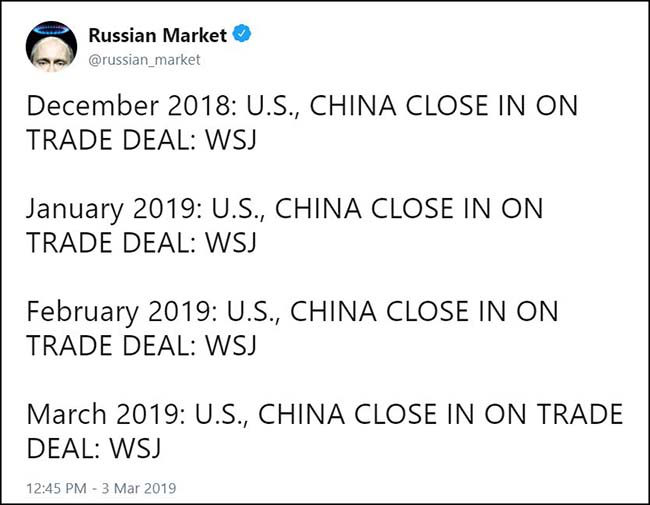 As highlighted in last month’s My 2 Cents (read that here https://properguidance.com/february-2019-market-update-outlook/) is the business cycle dead with perpetual central bank intervention? 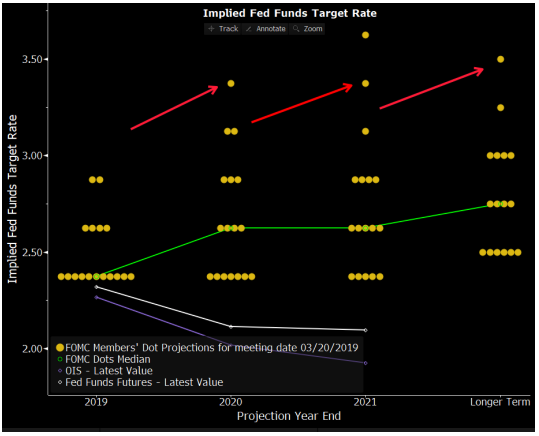 It certainly looks to be the case as the Fed not only left rates unchanged, but signaled that they aren’t raising rates this year. The bond market called the Fed’s bluff and is now signaling a rate cut before year end. Furthermore, the 10 year treasury bond and the 3 month T-Bill inverted for the first time in the cycle. 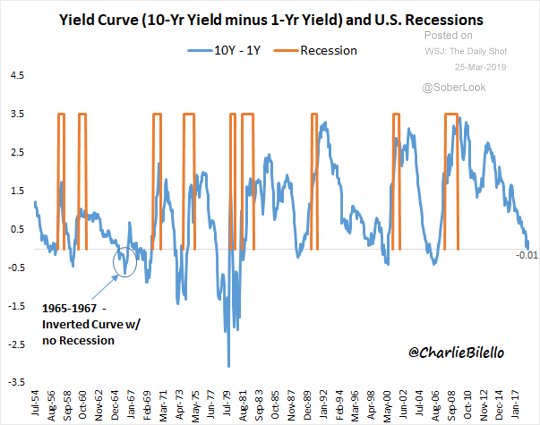 While we had some inversions occurring in the yield curve, this is one of the more widely followed inversions. The Fed’s median long-run rate projection is now 2.75% but would be even lower without three unusually hawkish FOMC members, whom the others now seem happy to ignore. A large majority of the FOMC now favors no additional rate hikes. What’s more, the Fed will now taper the liquidation of its holdings in May and stop in September. More important, they will also let their mortgage securities portfolio mature and use the proceeds to buy more Treasury securities which should create more liquidity and reduce the dollar’s value against other currencies. That means purchasing a minimum of $300 billion in predominately shorter-term U.S. Treasuries in 2020. Concluding, basically, QE-lite is coming. -The average span between inversions and subsequent recessions has been 11 months, with a range of five months (1973) to 16 months (2006-2007). -The average return for the S&P 500 during the spans from inversion to recession has been +2.8%, with a range of -14.6% (2000-2001) to +16.5% (2006-2007). -By looking only at the spans between inversions and recessions, it masks much of the equity market weakness associated with the end of each of these cycles. In conclusion, trees don’t grow to the moon and as our economy approaches and likely becomes the longest expansion on record, investors need to ask themselves how much upside is left in the markets and what will the Fed (and global central banks do) when the jewel of developed economies loses its shine. Memos from Howard Marks: Always a worthwhile read is Howard Marks’ quarterly letters. 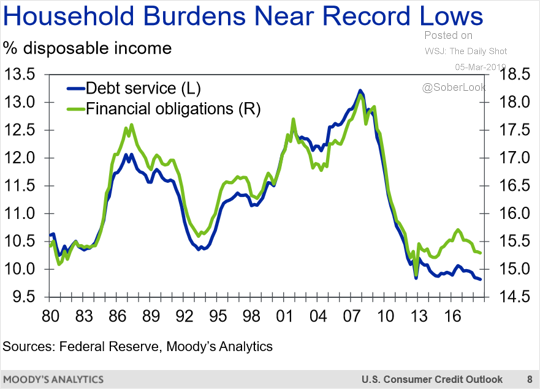 Perhaps one measure that’s not flashing recessionary is the debt service levels and financial obligations as a % of disposable income is still low and hasn’t risen like it has in past times. 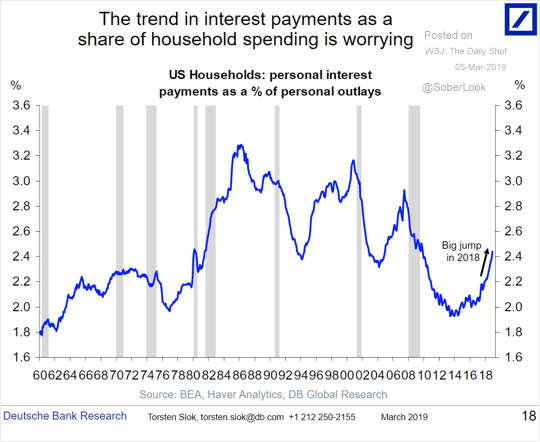 However, as reported by Deutsche Bank, personal interest payments as a % of personal outlays is trending upward. The price to earnings ratio has a high correlation to future annualized returns whether you’re looking at 7 or 10 year returns. 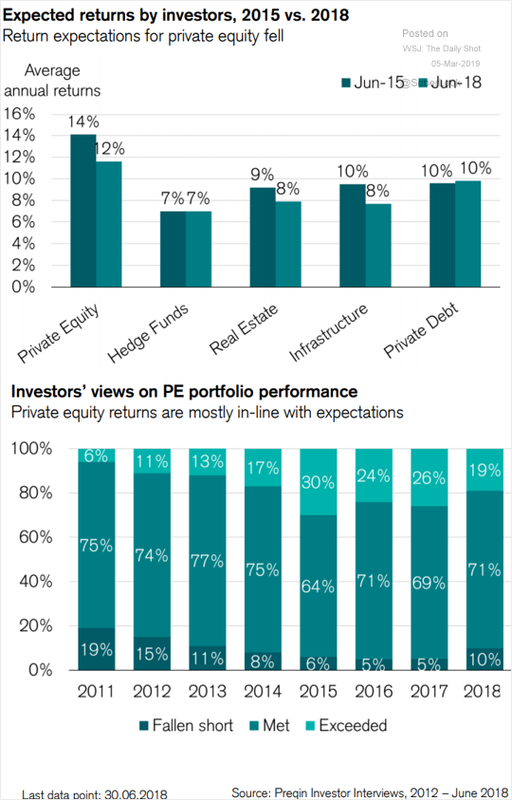 The higher the PE ratio the lower the future returns. 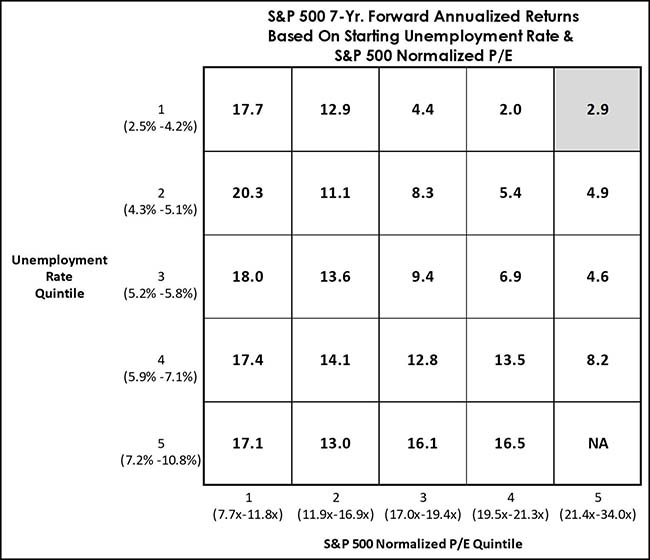 Based on the above table, the returns for the next 10 years are projected to be very low. 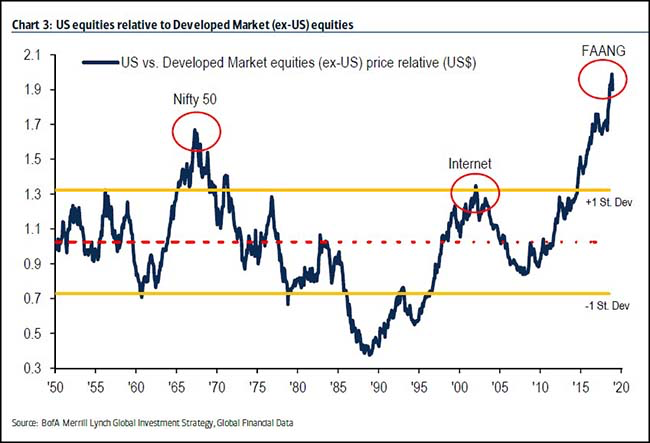 The US stock market valuation relative to other developed markets is at the highest since 1950 (as far as the chart goes back to). Right now, European equity markets are looking more attractive solely based on valuation. However, things are typically cheaper for a reason. 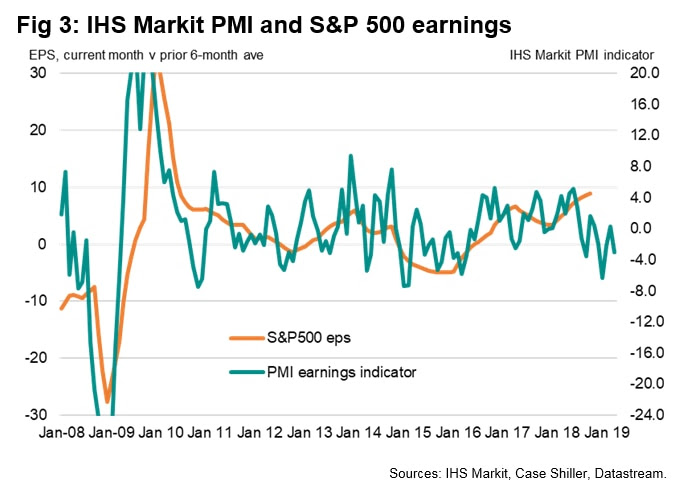 The IHS Markit PMI has been declining and has a high correlation to the S&P 500 eps. Recent eps estimates show Q1 declining. Another chart showing a yield inversion. This time it’s the 10 year minus the 1 year. Outside of the late 60’s initial inversion, a recession has followed in short order. 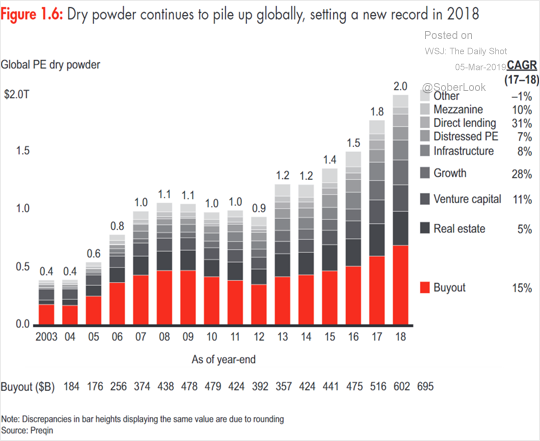 Global private equity dry powder (funds that have commitments although haven’t called the cash) has been steadily rising as more and more funds come to market. This while fewer deals are to be found. Our expectation is that returns will come down in the asset class (as a whole) and will result in a reduction of private equity funds therefore creating better future returns for investors. 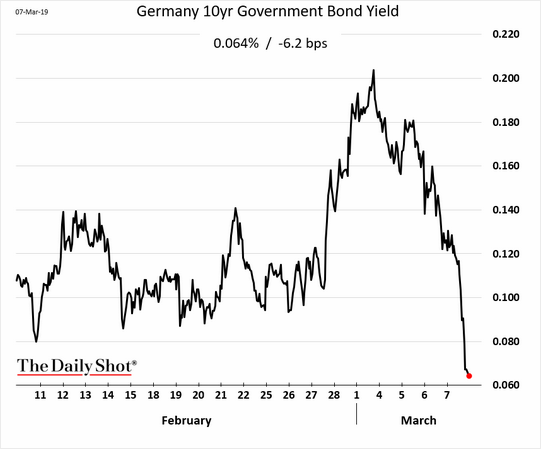 As growth is slowing across Europe and Germany, the yields on bonds are falling as well. 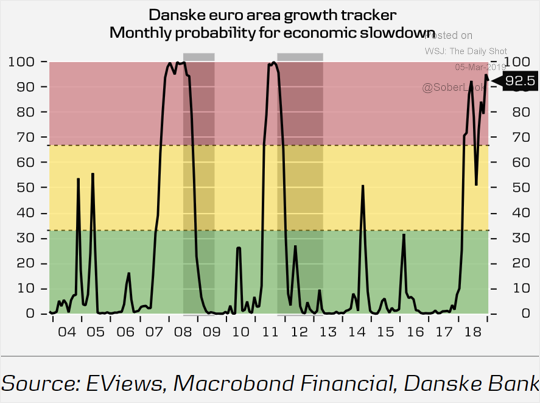 If the Euro area isn’t in a recession right now, it will likely be very soon. If you’re interested in starting a dialogue and learning how we can help, please contact us. Jared Toren is CEO and Founder at Proper Wealth Management. Proper was born out of frustration with the inherent conflicts of interest at big brokerage firms influencing advisors to sell products that were not suitable for clients but profitable to the firm along with a consistently mixed message of who’s interest was supposed to be put first; the clients’, the firms’, shareholders or advisors. At Proper, our clients interests come first. We are compensated the same regardless of which investments we utilize so there’s no incentive for us to sell high commission products. Since we focus on a small number of clients, we are able to truly tailor our advice to each person’s unique circumstances.